The MailboxWorks offers several types of USPS approved, pre-configured 4C horizontal mailboxes by Auth Florence Manufacturing. You can mix and match 4C cluster mailbox modules to customize your centralized mail delivery system to meet your project needs. Both front loading and rear loading 4C horizontal mailboxes offer secure mail delivery solutions to apartments and multi-unit tenant buildings (commercial and residential) that are under property management and are USPS serviced. The USPS approved 4C mailboxes may be installed inside or outside a building, recessed or surface mounted in a wall, or mounted in a kiosk. Rear loading 4C mailboxes require a secure mailroom for the USPS carrier access to load the mail. Auth Florence 4C horizontal mailboxes are simple, easy to use and extremely versatile. They undergo stringent security testing by the USPS and feature thick, vandal proof reinforced mail collection doors with one-piece extruded hinges that are designed to resist prying. They also include standard heavy-duty cam locks and at least one parcel locker for every ten commercial mailbox compartments. For security and privacy reasons, and to better comply with accessibility regulations, The MailboxWorks also recommends your horizontal mailbox compartments be sequentially numbered. Before you install your new USPS approved 4C mailboxes, The MailboxWorks recommends that you first check with your local postmaster. The USPS will need to approve your intended location and placement of the versatile 4C mailbox suites. Only the USPS is able to install the master lock on the Florence 4C mailbox main access door. USPS is also the only ones with the master lock keys that can access all tenant compartments through the main access door. Your new versatile 4C mailbox suite also includes Florence Manufacturing Company’s 5-year Product Warranty (which begins from the product’s purchase date). The 5-year 4C mailbox warranty covers any manufacturing defects in workmanship and/or materials. For more warranty details see the Florence Product Warranty PDF file. 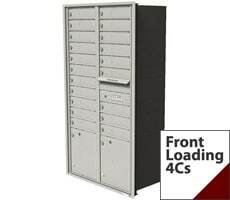 Versatile 4C mailbox suites may be ordered with or without parcel lockers, which are used for delivering mail packages that are too large to fit within the tenant mailbox. To learn more about how 4C mailbox parcel lockers work, please see our 4C mailbox FAQs section. 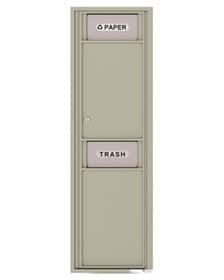 Versatile 4C mailboxes also come equipped with an outgoing mail slot so that tenants can post their outgoing mail. The MailboxWorks offers 8 different color options for Florence 4C mailboxes. These include dark bronze, antique bronze, gold speck, silver spec, black, white, postal grey, and sandstone. Florence Manufacturing recently introduced a new set of mailbox door height options into their line of versatile 4C mailbox suites. The new door heights allow you to further customize your centralized mail delivery system. The standard tenant mailbox height is 1 inch, however mailboxes can now be ordered in the following heights: 2”, 3”, 4”, and 5” high. Now, even outgoing mail collection compartments can be ordered in the same five height options. For more info see our page on Door Size Options for 4C Mailboxes. Florence 4C mailbox tenant doors come with the standard 1.5 x 1.75 inch silver decals. They may be customized with engraved numbers that can include a white fill, a black fill, or no fill. Mailbox door decals are sequentially numbered, which is recommended to ensure the privacy and safety of the tenants. 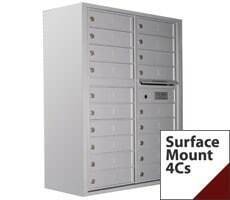 The United States Postal Service (USPS) has rigid guidelines when it comes to the standards for the construction of these versatile locking commercial 4C mailbox suites. All 4C horizontal mailboxes are extremely rugged and subject to installation requirements for maximum height and distance off the floor. On October 2006, the USPS-STD-4C was implemented, which applies to all wall mounted commercial mailboxes for centralized mail distribution. These include all mounted gang mailboxes installed in urban and rural settings. Centralized mail delivery systems are highly efficient for mail delivery and collection. They offer better mail protection and provide easier access for both the tenants and the USPS mail carriers. The most common type of installation for versatile 4C mailboxes is recess mounted, where the 4C mailbox suite is recessed into the wall. For rear access to mailbox compartments, the back of the 4C mailbox suite must be accessible through a secure mailroom located behind the wall. For front access to mailbox compartments, the 4C mailbox suite must have a front access master door. The entire unit must either be recessed into the wall or surface mounted on to the wall. Sometimes, for various reasons, the 4C mailbox suite cannot be recessed into a wall and can only be surface mounted using a surface mount collar. This commercial mailbox collar is specifically designed for use only with front loading surface mounted 4C mailboxes. The collar adds a finished look to your new centralized mail delivery system. The mailbox surface collar is installed first and the matching 4C mailboxes are then recessed into the collar (and not recessed into the wall). Florence versatile 4C mailboxes can also be ordered as 4C pedestal mailboxes ranging from 1 – 7 mailbox doors, 8 – 15 mailbox doors, and 16 – 29 mailbox doors. Pedestal 4C mailboxes can also be ordered with or without parcel lockers, collection drop boxes, and or trash/recycling bins. Florence Manufacturing front loading 4C mailboxes feature all new tenant and parcel door sizes plus mail collection and outgoing mail door slot options. The modular design allows these Auth Florence horizontal mailboxes to be configured with up to 20 tenant doors per module. Plus, individual commercial mailbox compartments can be customized to include single, double, triple, quadruple, and quintuple equivalent sized mailbox compartments. Both front load and rear load 4C horizontal mailboxes are finished with weather resistant powder coating and are available in up to 10 different colors. If your project doesn’t have the proper wall depth to recess mount your front loading 4C horizontal mailboxes then you can surface mount 4C mailboxes on the wall with a surface mount collar. Surface mount mailbox collars include mounting hardware with hidden fasteners. With the collar, your 4C horizontal mailboxes can be installed on any wall with conventional wood studs. Mailbox surface mount collars may also be installed into other surfaces using the appropriate hardware. The collars also feature a powder coat finish to match your 4C mailboxes. Florence 4C mailbox suites may also be converted for “Private Mail Delivery Service.” You can order the private mailboxes conversion kits here. Private use 4C mailboxes do not include the USPS arrow lock on the master door. The conversion kit can be utilized for both the postal access door and the parcel locker doors. Front loading Florence 4C mailbox units are the most common. They include a USPS installed arrow lock that allows the USPS carrier to access all tenant mailbox compartments by opening the front access master door. Only the USPS can open the front access master door. Although less common, rear access 4C mailboxes must be recessed into a wall. This allows the USPS carrier access through a secure mail room behind the 4C mailbox suite. Rear access 4C mailboxes do not have a front access master door and the rear access door does not have a locking mechanism. If you need assistance to determine whether you need a front access or rear access versatile 4C mailbox unit, please call our mailbox expert’s toll free at 1-866-717-4943. Whether you are installing front or rear loading 4C mailboxes, recessed or surface mounted 4C mailboxes, or a Florence Manufacturing trash/recycling bin, you can find The MailboxWorks versatile 4C mailbox suite installation guidelines here. Be sure to contact your local postmaster and follow the USPS Installation Requirements outlined in the 4C mailbox installation guidelines. All Auth Florence 4C commercial mailboxes for sale are STD-4C compliant and USPS approved; they meet or exceed the USPS standards. Each state or region may have their own accessibility regulations so The MailboxWorks recommends contacting your local post office to review the location of your new 4C horizontal mailboxes. If you are unsure of the installation requirements for 4C mailboxes or need help configuring your order for your project, please ask for assistance. One of our commercial mailbox experts would be happy to assist you. For free 4C horizontal mailboxes layout assistance, simply call us Toll Free at 1-866-717-4943 or complete our online mailbox contact form. Browse our MailboxWorks Flickr photos for 4C horizontal mailboxes. Florence 4C mailbox suites can be ordered with up to 29 tenant mailbox compartments. For USPS postal delivery, your 4C mailboxes must include at least one parcel locker for every 10 tenant mailbox compartments. 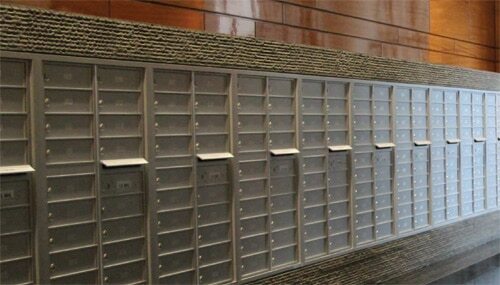 For instance, a versatile 4C mailbox suite with 20 tenant mailboxes would require at least 2 parcel lockers. 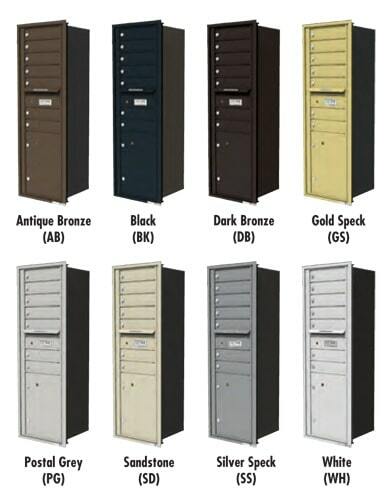 Versatile 4C mailboxes that are ordered for private mail distribution can be purchased with or without parcel lockers. The MailboxWorks already offers versatile 4C mailboxes at prices below the manufacturer’s recommended list price. We are also able to offer additional discount pricing on bulk orders between 2-5 units and for orders with 6 or more 4C cluster box mailbox suites. Unless otherwise stated (and depending on the product selection), The MailboxWorks offers Free Shipping with each versatile 4C mailbox purchase. Depending upon your location, standard 4C mailbox orders will usually ship within 2-3 business days and be delivered within 1 – 5 business days. For custom 4C mailbox orders, the shipping time is usually within 1 to 2 weeks with delivery approximately 1 – 5 business days from the shipping date. Versatile 4C mailboxes are shipped directly from the manufacturer using common carrier delivery. The MailboxWorks also offers a selection of 4C cluster mailbox replacement parts. If you cannot find the replacement part you need, please call our toll free number at 1-866-717-4943 for assistance. Versatile 4C mailbox replacement parts may include among others, key blanks, mailbox door decals, mounting hardware, mailbox replacement locks, conversion kits, and mailbox replacement doors. Who do I contact regarding the placement location of a new or replacement 4C mailbox? Contact your local postmaster to determine where to install your new mailbox. They can also provide you with details on what mailbox unit is needed for replacement. Do not contact your local letter carrier. What is the difference between a recessed 4C mailbox and a surface mount 4C mailbox? Recessed mount mailboxes are installed into a rough opening in a wall that is made to fit the exact length, width, and depth of the mailbox unit. Surface mount mailboxes are installed on a flat surface. Are there USPS regulations about wall or pedestal mount mailboxes? Please contact your local postmaster to review your specific mailbox installation location needs in order to determine the right option for your application. I’ve noticed that 4C mailbox units have a longer ship time than CBU mailboxes. Why is that? 4C mailbox units are custom made to order, which requires additional lead time at the manufacturer’s level. CBU mailboxes are pre-made and ready to ship to the buyer as soon as the order is place. How big is the outgoing mail slot on 4C mailbox units? Does the outgoing mail slot on the 4C mailbox unit offer theft protection? Yes, there is an aluminum comb on the outgoing mail slot that helps prevent mail fishing and the removal of outgoing mail. Can I remove the outgoing mail slot? No. The mail slot and compartment cannot be removed from the 4C mailbox unit. Can a USPS 4C mailbox be customized with a private mail slot? No. Only the USPS can place items in 4C mailboxes that are serviced by the USPS. Adding your own private mail slots can compromise the security of the mailbox unit and enable mail fishing. I just received my new 4C mailbox but can’t find the keys. Where are they? Keys for 4C mailboxes with parcel lockers: All 4C mailbox keys, hardware, and installation instructions are in the left side parcel locker. To open, reach into the center of the unit and push up on the bracket located in the upper left corner. This will open the right-side gate and allow you to open the left-side gate and give access to the left side parcel compartment. 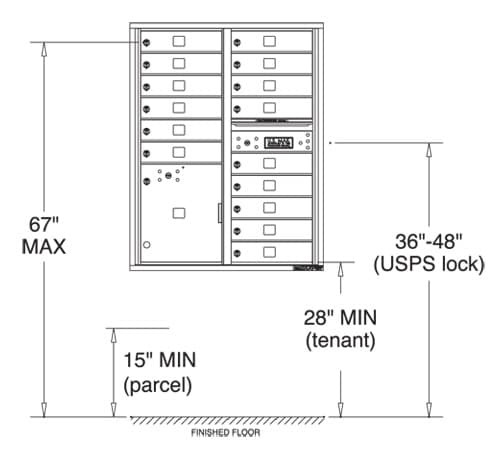 Keys for 4C mailboxes without parcel lockers: All 4C mailbox keys, hardware, and installation instructions will be found in one of the tenant door compartments. NOTE: Before completing the following steps ensure that the 4C unit is securely placed on a flat surface so that it doesn’t fall over when the master front door is open. How do I get a master door lock for my 4C mailbox? Once you have installed the mailbox unit contact your local post office to come install the master lock(s) on your new 4C mailbox. This can only be done by the USPS. How many characters can be engraved on the mailbox doors? You can engrave up to 12 characters per line and up to 2 lines. What size of numbers can be engraved on the mailbox doors? All engraved characters are ¾” tall. What size of decals are used for mailbox door identification? How many characters fit on a decal? 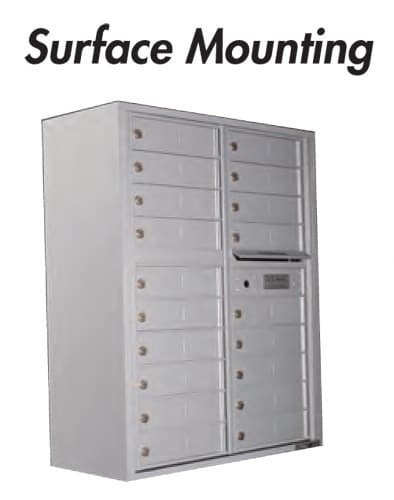 Parcel lockers are the part of a 4C mailbox used for package delivery to store oversized packages that do not fit into individual tenant mailbox compartments. Sometimes a tenant will receive a package that does not fit into their individual tenant mailbox compartment. The USPS mail carrier will put a key tag and instructions in the tenant’s mail slot and secure the package in one of the parcel lockers. The key tag and instructions give the tenant/recipient access to the larger parcel locker. All the tenant needs to do is open the corresponding parcel locker with the provided key and remove their package. Once the key is inserted into the parcel locker lock it cannot be removed and stays in place until it is retrieved by the mail carrier. What is a captive lock? 4C mailboxes have a captive lock on all parcel lockers, which means that once the key is inserted it can only be removed by the authorized mail carrier on their next visit. Can I use the parcel locker as an extra tenant mailbox? No. 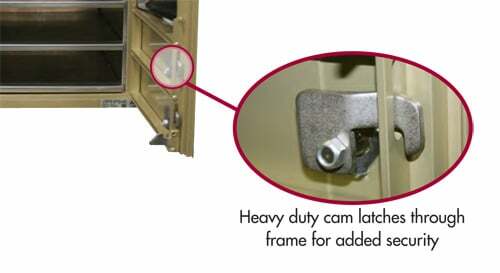 Parcel lockers have a captive lock and do not work the same as tenant mailboxes. Furthermore, the USPS regulation restricts 4C parcel lockers from being removed, changed, or modified for any other purposes other than parcel delivery by the USPS. Does the USPS require parcel lockers? Yes, all locations with 10 or more mailbox compartments require a parcel locker. At their discretion, your postmaster may approve a 4C mailbox with no parcel locker in the case that an alternate secure receiving facility is available (such as a separate bank of parcel lockers). Do all 4C mailboxes come with parcel lockers? No. There are also 4C mailboxes without parcel lockers for units with less than 10 tenant doors that do not require a parcel locker. Larger 4C mailboxes without parcel lockers are available for locations that have a USPS approved alternate secure receiving facility. What does Centralized Mail Delivery Mean? Centralized mail delivery is a form of mail delivery where a local mail carrier delivers and collects mail at one central mailbox unit rather than to each individual residence. What are the benefits of centralized mail delivery system to 4C mailbox units? Whether it is a single-family subdivision or a multifamily or office complex, 4C centralized mail delivery improves mail delivery services. Mail is delivered to a convenient central location. USPS mail carriers are able to make multiple deliveries with just one stop, which results in faster service, lower fuel consumption, and lower carbon emissions. Can 4C mailboxes be used as a Centralized Mail Delivery System? 4C mailboxes are “clustered” style community mailboxes designed for centralized mail delivery. This includes CBU mailboxes (or cluster box units), which are free-standing and mounted on a pedestal, plus other types of STD-4C compliant cluster mailboxes that are mounted on (or in) a wall, a kiosk, or an outdoor mailbox shelter. Does the 4C mailbox need to be USPS approved? All centralized mailboxes serviced by the USPS, including 4C mailboxes, must be USPS approved. This means the gang mailboxes have gone through rigorous testing and approval prior to being sold in the marketplace. Check with the local Postal Authorities early in your construction project for your new residential or commercial development. Ask about the mail delivery plan required by the U.S. Postal Service for your planned project. Yes, as of October 5, 2006 all new construction and major renovation projects require the new “4C” postal standard mailbox units that are U.S. Postal Service compliant. What makes the new STD-4C compliant mailbox system different? Mailbox Shape – The traditional cube style mailbox compartments have been updated to flatter style horizontal compartments. The new minimum size requirement is 12′′w × 15′′d × 3′′h. Parcel Storage – The new 4C mailbox units incorporate a fully integrated (or stand-alone) parcel locker option. A minimum of one parcel locker per 10 tenant mailbox compartments is required. Mailbox Security – They also have strengthened security requirements for the entire mailbox receptacle and an improved, standardized tenant mailbox compartment lock design. ADA Compliant – New STD-4C mailbox systems also meet the requirements of the Americans with Disabilities Act (ADA). Please Explain What the USPS-STD-4B+ Standard Means? The United States Postal Service (USPS) developed the USPS STD 4B+ standard in an effort to improve mailbox security. They did this by strengthening and improving the arrow lock compartment of the mailbox master door. This standard is applied to vertical commercial mailboxes (such as the Florence model 1250), as well as apartment complex mailboxes such as the horizontal style Florence 1400 series mailboxes. Can I install Standard USPS-STD-4B+? As of October 2006, 4B+ vertical and 4B+ horizontal mailboxes are only approved for replacement and/or retrofit installations. 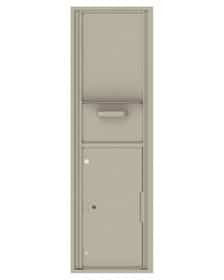 New construction and major remodels require that Florence Versatile 4C horizontal mailboxes be installed. You can find Florence 4B+ mailboxes here. How do the new regulations affect what type of centralized mailbox I buy (4C or 4B+)? Is the mailbox being used for new construction? a) If yes, only 4C rated mailboxes or free standing CBU mailboxes must be used. a) If yes, then 4B+ rated vertical or horizontal mailboxes can be used. b) If you are adjusting the RO, 4C rated mailboxes must be used. If installed inside, any community mailbox model can be used depending on your answer to question 1a and 2a/b above. If installed outside (and unprotected), install 4C mailboxes, as the 4B+ mailboxes are NOT rated for outside use. How were the USPS standards set? The United States Postal Service first studied various factors like mail size, the volume of mail received, the mail delivery system efficiency, and other things such as mail theft and vandalism. These factors, along with forecasting the future needs of efficient mail delivery, helped the USPS to create an Apartment Consensus Committee. The committee reviewed the findings in order to make more informed decisions about community mailboxes. This committee included representation from mailbox manufacturers like Auth Florence Manufacturing, plus mailbox service providers, resellers, property management companies, and owners, as well as members of the USPS. Following a year of meetings and discussions the committee agreed on a set of new mailbox requirements. These STD-4C regulations are now mandatory for centralized mail delivery systems serviced by the USPS. What is the purpose of the new 4C standards? Ultimately, the regulations are designed to improve mail service. Will mailbox regulations change again soon? Prior to the October 2006 change in regulation, the USPS last revised mailbox standards in 1975. These previous standards were used for 30 years and were effective for the drastic increases in mail delivery during that period. It is not easy or quick to change mailbox standards. The USPS aims to ensure these new mailbox standards will protect and manage future mail trends. How can I tell if a mailbox meets USPS requirements? 4C mailbox manufacturer Florence Manufacturing, places a USPS Approved Logo on each mailbox product that meets these STD-4C mailbox requirements. At MailboxWorks, we offer an extensive range of USPS approved community mailbox products. Our customers can shop the versatile 4C mailbox suite collection to mix and match 4C modules for the perfect configuration. Prior to starting, we encourage you to check with your local postmaster about mailbox requirements and any changes to your building’s mail delivery system. Where is the manufacturer’s name on the mailbox? You can find the manufacturer name on the front of the mailbox unit, typically on the Outgoing Mail door or in one of the bottom corners. Note: the product description content on this page has been paraphrased and reposted with the permission of Budget Mailboxes.